EPA 31 MPG Hwy/22 MPG City! LOW MILES - 32,830! Premium Plus trim. NAV, Sunroof, Heated Leather Seats, All Wheel Drive, iPod/MP3 Input, Rear Air, Turbo, WHEELS: 8.5J X 19" 10-SPOKE-DESIGN, TECHNOLOGY PACKAGE, Alloy Wheels. CLICK ME! Leather Seats, Sunroof, All Wheel Drive, Rear Air, Turbocharged, iPod/MP3 Input, Aluminum Wheels, Dual Zone A/C, Heated Leather Seats. Steering Wheel Controls, Electronic Stability Control, Bucket Seats, Brake Assist, HID headlights. TECHNOLOGY PACKAGE Audi connect, TFT 7" color display screen, MMI high control panel, WVGA, control knob w/joystick and buttons in center console, Operates climate control, central locking, instrument cluster, vehicle diagnostics, cellular phone, navigation, CD, radio functions and color driver information system w/trip computer, Parking System w/Rearview Camera, Audi Side Assist, lane change assistant, operates at speeds above 19mph, visual warnings located in exterior mirror housings, Radar technology located behind rear bumper (not visible), Can be turned off, HDD Navigation w/Voice Control, speech-to-text engine and controls cellular phone, CD, radio and navigation, Radio: 1 CD/DVD-Player & HD, Bluetooth streaming audio and SiriusXM Traffic w/4-year, PREMIUM PLUS PACKAGE S Line Fender Badges, S Line Bumpers, Memory Function for Driver, Auto-Dimming Interior Mirror w/Compass, Heated Front Seats, Aluminum Door Sills w/S Line Badge, Side Sill Blades, Audi Advanced Key, keyless start, stop and entry (sensors in front doors), Auto-Dimming Heated Exterior Mirrors, driver memory feature, WHEELS: 8.5J X 19" 10-SPOKE-DESIGN Tires: P255/35R19 Summer Performance. 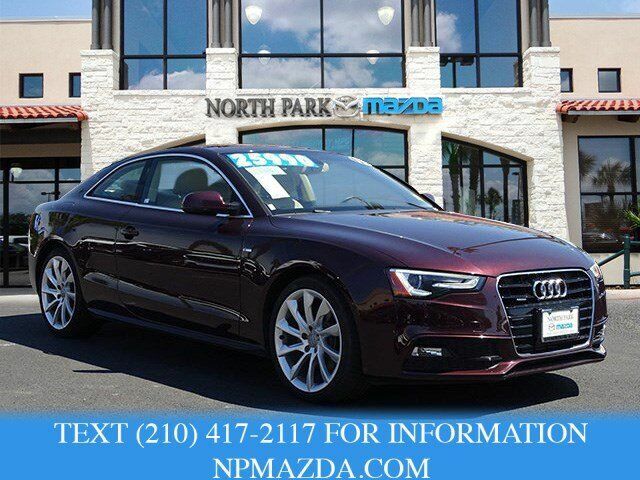 Audi Premium Plus with Shiraz Red metallic exterior and Velvet Beige / Black interior features a 4 Cylinder Engine with 220 HP at 4450 RPM*. "With its pleasant driving demeanor Great Gas Mileage: 31 MPG Hwy.